Colours are more powerful than you might think. Have you ever stared at a red colour and felt angry or passionate? What about being surrounded by tranquil colours like green and white and feeling a sense of peace and relaxation? Colour psychology is used every and it has some powerful effects on human behaviour. In fact, by simply changing the colour of the walls around you, it’s possible to completely change your mood and evoke an entirely different sense of emotion. Our bedrooms are often underutilised when it comes to interior design and decor. Since we spend most of our time in our bedrooms sleeping, it feels like we shouldn’t invest much effort or money into it outside of getting a nice mattress–but this is completely wrong! Yes, we spend a lot of time in our bedroom with our eyes closed, but we also spend the most important time of day in our bedroom with our eyes open–waking up! Coloured furniture can help put you in the right mood when you wake up, but what mood you desire will depend on the colours you see. 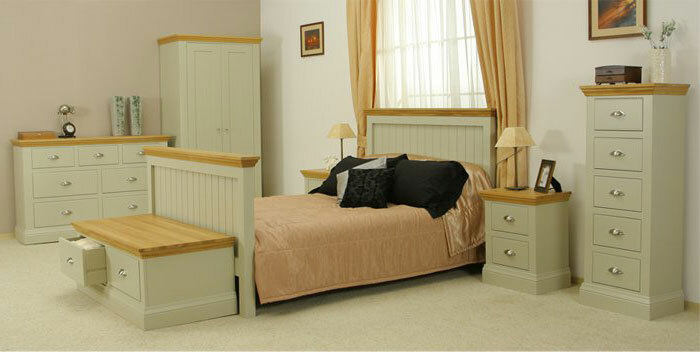 This is another reason to get painted bedroom furniture that you can customise! It’s actually incredibly easy to paint your own furniture. If you change your mind, you can easily paint over it with another layer or scrape it off and work on it again. Painting doesn’t require much effort either. As long as you get the right colours and make some time, it’s easily something you can do on your own. Furniture in Fashion has been selling furniture for many years. We’ve worked together with many different clients and we’ve always offered a hand to people who need it. Whether you’re curious about our paintable furniture or if you have questions that need answers, we’re more than willing to assist you. You can contact us by phone or you could email us. We’re also on social media, so don’t hesitate to contact us with your preferred method.